This page consists of the following five parts contributed from Minsk. Nakagawa received a personal communication from Mr. Khomenko first on Sept. 18. Since it was interesting, I asked Mr. Khomenko about the possibility of public posting. Communication and attached documents arrived in a revised form on Sept. 23 by email. Key phrases in the communication and in the Center Information are marked in boldface by Nakagawa. OTSM is the Russian acronym for General Theory of Strong Thinking, as you see in Khomenko's text. We are very grateful for this valuable contribution from Minsk. Thank you for your information about your trip to the former USSR. I'm glad you have seen so many people. I hope they have helped you understand the situation with TRIZ in the former USSR. Selutsky and Mitrofanov have probably told you how Altshuller made a system of public TRIZ centers around 1/6 part of the world (in former USSR and Eastern Europe countries). This year others state officers asked me to help them with teacher education on pre-school and school levels, and in Universities (several years already members of Minsk TRIZ Center delivered lecture at Minsk’s Universities). Time has changed but still volunteer researchers' teams in TRIZ are the most advanced ones. Informal organizations help move forward quicker than big formal organizations. All key ideas in TRIZ were found by small groups or (in most cases) by a single person. Of course, most ideas were produced by Genrich Altshuller. A lot of formal TRIZ organizations appear and disappear. The main reason is a conflict between people inside this kind of teams. But there are not so many sources of problems in informal research teams. For example – money and position. Everybody works as a volunteer, everybody has the same position. I prepared short information about history and activities of our Center and an outline of classes that I have provided during last years for various kinds of participants. Now it is not necessary to be an engineer to study TRIZ. My students were business people, preschool and school teachers, school students and of course engineers and research workers. I started developing this education technology in 1986 when Altshuller started 2 weeks seminars (earlier TRIZ seminars had lasted one month). At first beginners classes took 140 hours. Then Altshuller reduce them till 80 hours. In 1986 Altshuller started to develop new technology for teaching TRIZ. This technology was based on using tales. Why? First, it was attempt to develop TRIZ education technology for people without engineering background. Second, Altshuller come back to his researches that he had to stop in 1961. It was researches about Theory of Discoveries. Lot of people couldn’t understand him. I was participant of his classes in 1986. During that two weeks seminar in Simferopol (Ukraine) some people asked Altshuller to stop tales and start TRIZ. Those several people can not understand that Altshuller started new page in TRIZ history… But soon, in the end of 1986 he had to stop his classes around former USSR because of his serious illness. At that time he said that we had to develop courses not only for engineers. I already had 5 years experience in teaching and problem solving then and started developing this kind of TRIZ education technology. Today I send you an outline of this class. Maybe it will be interesting for you. Your critical opinion is highly appreciated. You may find this outline unusual. But a lot of this things I was discussing with Altshuller during last ten years. And he gave me permission to use the name of OTSM for this approach. He used this name in his manuscript about TRIZ as a common approach to problem solving, not only for engineering problems. I know it is unbelievable but it is true: people who studied TRIZ through this approach can analyze various kinds of problems, not only engineering. This is very useful for young children. That is why I spend a lot of time on teaching children, in particular. For example, I once gave an electronics problem to pre-school teachers. But they weren't afraid and started looking for contradictions, then they described their idea (it was difficult for them) and every electronic engineer could understand from this description that they were talking about capacitors. Before and after this I showed this task to electronic engineers and every time different people told me that task was not so easy and solution was not ordinary. But first time this task was solved by mechanical engineer after his graduation from our TRIZ school. He has just common knowledge about electronic. In my mind this example show that TRIZ knowledge is special kind of knowledge – knowledge about system using divers particular knowledge. TRIZ knowledge help to solve problem from different fields of Human activity. Of course TRIZ expert can not know everything. But team work with specialist of this different particular fields was very effective. That example with preschool teachers showed me that my approach helped them describe the solution sufficiently enough to understand what this solution is. Step by step students looked for a system of contradictions and step by step described new and new details about the solution. For developing these skills I use a very simple game and I make several small groups (2-3 people) compete in asking questions. And I show them how we can play this game using TRIZ approach. This is the first part of the seminar. During this part we study how to use TRIZ technologies beyond the field of participants. This is the most difficult part of the classes. During the second part of the seminar when participants have understood the main ideas of TRIZ in practice we start learning how to use this TRIZ technologies for real problem solving processes. It is not so difficult because during the first part of the seminar we use training tasks, but these tasks have all properties of real problems. Now my colleagues apply this approach to school and preschool education in Minsk (Anna Korzun, Natalia Simonenko, Sergey Sokolov, Svetlana Lavrentieva) in Ulianovsk (Tatiana Sidorchuk), in Toliatty (Nadezhda Zhuravleva) in Riga (Ingrida Murashkovska, Alexander Sokol). All of these people started as volunteers. Some of them now state officers. For example, Tatiana Sudorchuk is Head of Department of Creativity in pedagogical college and scientific head of state research center based on kindergarten. She has conducted a long term (about 10 years) experiment about teaching TRIZ to preschool children. By the way Anna Korzun (you met her in Minsk) was a student of Tatiana Sidorchuk, Alla Nesterenko and Ingrida Murashkovska. And our Center paid for Anna's business trip to Ulianovsk. This is usual for the Minsk Center of TRIZ Technologies to help people pay for business trips to learn TRIZ from the best specialists from different cities. Another volunteer Alexander Sokol start to learn TRIZ at school (7-th grade). He was interested in linguistic. During 10-th grade he start to teach TRIZ student of others schools. He was leader of students TRIZ club. Soon he will be graduated from University. Several yeas he develop his technique for learning English language and TRIZ together. This is very interesting researches. I hope we can use his results in our Jonathan Livingston educational project of Minsk TRIZ technologies Center. By the way this project is developed for many years by volunteers too. This tradition was established by Genrich Altshuller: unusual project has to be developed by volunteers. I will be glad to continue our communication by E-mail. In 1996, the Minsk School of TRIZ (currently Minsk Center of TRIZ technologies) commemorated its 20th anniversary. The Center was founded in 1976 by Valery M. Tsourikov (currently CEO of IMCorp, USA, Boston see: http://www.invention-machine.com ). Main aim of this activity was with the aim of training personnel for the Invention Machine Project. The school was quickly recognized by the industrial, academic and educational organizations located in the city. Students, engineers, scientists of industrial companies and research institutes of Minsk began to participate in its activities. In 1985, Valery Tsourikov started new stage of Inventive project and Nikolai Khomenko took over the leadership of the school. Since then the main project of the Center became "Jonathan Livingston Project" which provides assistance in reorganization of the existing educational system and directing it towards the development of creative capabilities of children starting from the age of three. Jonathan Livingston Project was started by Nikolai Khomenko in 1983. The Minsk Center of TRIZ Technologies is a non-profit research organization which is formed by the TRIZ professionals with large experience working in various fields related to the applications of Altshuller's theory: scientific research, engineering activities, organization and carrying out of publicity and election campaigns, re-engineering of business processes, developing expertise with projects of commercial and state organizations. And, of course, the area of education ranging from kindergartens to the universities. It is necessary to point out that during Altshuller’s period of TRIZ history (duration of the period is 53 years) TRIZ was developed under Altshuller direction by non profit organizations of people that was founded by Altshuller’s students around the former USSR. An informal organization of the Center helps to maintain creative environment of cooperation and development. Among the collaborators of the Center are professionals working actively in the fields of teaching, research, and consultations. The Center has a comprehensive collection of information related to various aspects of TRIZ theory and practical applications. Ongoing research and development targeted at advancing of the TRIZ methodology makes it possible to maintain a high level of annual training in TRIZ. Members of our Center deliver lecture in Minsk Radioengineering University and in The University of Modern Knowledge. Graduates of the Minsk Center of TRIZ technologies work as TRIZ consultants, trainers, and experts at the leading companies in Asia, America and Europe, and some of them have management positions. The specialists of the Center develop schoolbooks and training materials. To disseminate information about the Center and TRIZ, the WEB-site of the Minsk TRIZ Center has been maintained since 1997 by Nikolai Khomenko and Dmitry Kutcheriavy. The Minsk Center does not limit its activities to the national scale. We also conduct seminars both in the CIS countries and outside CIS, as well as for students visiting Belarus. We constantly share experience with our graduates and TRIZ professionals who live and work worldwide. When necessary, we help specialists who wish to learn the basics of TRIZ. We also help to establish collaboration with leading specialists in the field of TRIZ technologies who live and work in various regions. 1) G.S.Altshuller wrote in his manuscripts that TRIZ must be transformed into General Theory of Strong Thinking. TRIZ open the door on the road to this General Theory. He gave name to this Theory and Russian acronym of this name is OTSM. In 1997 after reading some materials of Nikolai Khomenko Altshuller gave him permission use this acronym. And then Altshuller added: “But please every time explain history of this acronym”. That is why this footnote appear. What and How participants study along the course. Team work in small groups (2-3 people per group). Spatial training tasks for learning how the main tools of TRIZ (TRIZ technologies) work together. Training for description of real problem situation as a system of contradictions. Training for looking for directions and main ideas of solutions (using real problem of participants). The Key Task of problem solving process. Evolution contradiction of problem solving process. 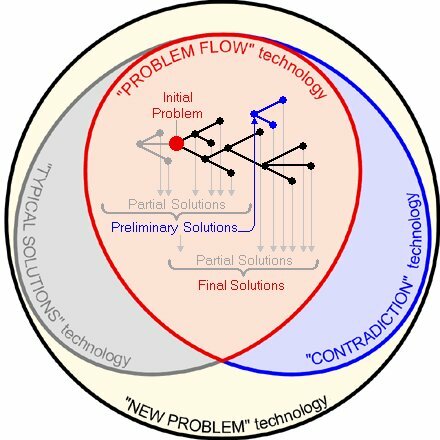 Main ideas of TRIZ approach to resolving of problem solving process evolution contradiction. Idea of Objective Law of system evolution. Main models of element description useful for problem solving process. “Element – Features” Model (E-F Model). “Element – Name of Features– Value of Features ” Model (E-N-V Model). What is Function of system: ordinary approach; “Verb-Object” approach, “E-N-V” approach. What is Element and what is System in E-N-V Model. Full scheme of Strong Thinking - classical and advanced approaches. Understanding problem using Idea of Objective Law of system evolution. Understanding problem using Idea of Particular Situation. Understanding problem using Idea of Contradiction. Main parts of problem description: Set of Resources (SOR), Ideal Final Result (IFR), Contradiction that prevents us from getting IFR using SOR. Roots of contradiction. Common sense as a typical solution. Review of TRIZ tools (principles, SF-analysis, pointers of effects and law of system evolution) through OTSM-TRIZ point of view. Distinctions between “Phenomena” and “Effect” through E-N-V Model point of view. General description of typical solution. General approach to applying typical solutions technology. What is contradiction and its connection to Ideal Final Result and Set of Recourses. Various kinds of contradiction: evolution contradictions; needs-knowledge contradictions; element contradiction; feature contradiction, elementary contradiction. Transformation of contradiction during problem solving process. Main principles of contradiction resolution or combination of opposite requirements. Resources analysis through contradiction approach using E-N-V model. Various kind of Ideal final results. “One cycle” and “Multi cycle” problem solving processes. Various kind of solution: Partial solutions, Preliminary Solutions, Final solutions. Various kinds of solution need divers kind of estimation of solutions. System application of main TRIZ technologies. Some aspects of Creative Personality Life Strategy and its influence on problem solving process.